During the holidays there are many new and exciting things we use to decorate around the house that can be as dangerous to your avian friend as they are pretty. We want your holidays to be fun and safe, so we are addressing the common holiday household dangers for 2009. Among the most common decorations for the winter season is mistletoe. This often seen holiday plant that harbors such a fairy tale legend also has a dark side. Mistletoe is part of the Viscaceae family, and the form commonly seen in North America is a hybrid plant of both English and European varieties. Mistletoe is famous for bearing it’s fruit in the winter months making it a popular decoration during the Christmas season. 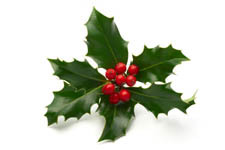 The red berries that are such a trademark of mistletoe are toxic to our avian friends, as are holly berries. Another favorite holiday plant, the Poinsetta, can cause GI tract irritation if ingested. Other holiday decorations such as tinsel, angel hair, and other common Christmas tree adornments are made of plastic. They should be kept out of reach of your bird(s) at all times, as they are made of plastic and could become impacted in the crop of accidentally ingested. Your favorite holiday scents can be dangerous to your birds, too. Burning candles should used with diligence, and birds should always be kept in the cage if a candle is lit. Candles, which have a bad reputation for lead in the wick are safer now due to new regulations. More bird owners are beginning to use them again. If you do use a candle, use one that is made out of a natural material such as soy or beeswax and is not heavily scented. Remember, our feathered friends have a respiratory system different than ours. Because of the way the air they breathe travels into their system any scent can be especially irritating. Remember as you invite guests into your home this holiday season to keep tempting foodstuffs away from your avian companion. Alcoholic beverages, avocado, coffee, and salted foods should not be given to your bird under any circumstances. Of course, with all these cautions, it doesn’t mean that your feathered friend can’t participate in the festivities of the holiday! Buying a festive bird safe toy to adorn the cage is a safe and fun way to celebrate and keep your companion happy and entertained. Many pet owners also have gotten into the spirit by choosing holiday themed toys for their avian companions. For added fun, wrap the ‘gift’ in a piece of newspaper and place in the bird’s cage. Watch the bird unravel the present with delight!